Hope, you are quite well and preparation for the Job.English is most important subject for all Competitive exams.Most of students bad result to ssc exams for english subject.So you more and more practice everyday. Here, GK Solve share three important pdf file to you for preparation of ssc exam. 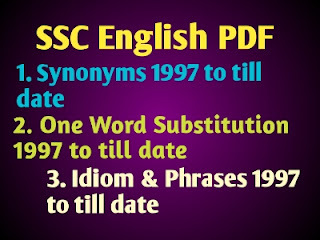 Today we share SSC Synonyms, One word substitution, and Idioms & Phrases pdf file 1997 to 2016 CGL Exams.This pdf file is so much important to you for batter practice of English.So download pdf file and practice daily right now. Download details given below this ads. GK Solve helps you every day, to give study materials, free of cost. So readers are request daily visit GK Solve and share blog address to your friends cercle.We need your Support. Thank you. very nice pdf. thank you for sharing.